Named after Dmitri Mendeleev, father of the periodic table, Mendelevium is a metallic radioactive transuranic element of the actinides. It is a synthetic element first identified by Albert Ghiorso in the Berkeley Radiation Laboratory’s 60-inch cyclotron. 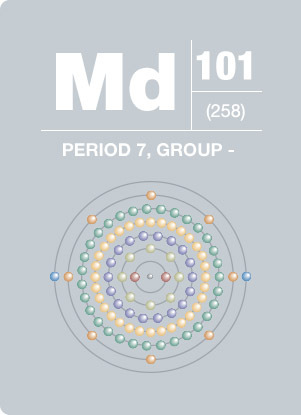 The isotope produced was 256Md, which has a half-life of 76 min. This first identification was notable in that 256Md was synthesized on a one-atom-at-a-time basis. As only very little mendelevium has ever been made, mendelevium has no uses.